SoulCollage® is a sacred listening practice. It is a very personal form of prayer that takes me to the place where soul and Divine Consciousness meet. From the hilarious to the terrifying, the complicated to the serene, each card is a gift, an offering from Me to me. The practice of SoulCollage® merges all of the senses into one fluid motion of inner awakening; sight becomes sound, becomes touch-opening memory to taste, smell and the mysterious sixth sense of intuitive knowing. Creation and creativity flow through each of us in all moments. SoulCollage®, like yoga, meditation, prayer, dance, song and deep uproarious laughter has the power to remind us of this truth. I have experienced every card to be Love at first sight (even the shadowy ones)…a love that grows as I blossom into the woman I am becoming, day by day, moment by moment. L: Seena, I am so honored to have you here on my blog today to answer a few questions for me and to bring your voice to my readers, many of whom know nothing about SoulCollage®. I offered my personal understanding and experience of SoulCollage® above. Since my training five years ago, two new cards, "SoulEssence and Witness" have been added to the deck. Can you explain for my readers what the Transpersonal, SoulEssence and Witness cards are? S: I recommend reading my two articles on the website that discuss the Transpersonal cards. You have to click my name to get to the list. They are near the bottom. Very briefly, these three cards are a card for Source which is the Oneness out of which all forms are manifested, that Mystery, or Spirit, or Ground of Being, whichever name you might choose. Second, is a card for SoulEssence which refers to the spark of Source within each Soul, within each living thing; our unique and divine coding. Third a card for Witness which is that potential in humans to become conscious of all our parts of Soul and to step back and see ourselves without judgment. None of these three cards in our deck has a voice as all the other cards do because they are Transpersonal; they are beyond our ability as humans to capture them with our thoughts. L: Thank you Seena for bringing more clarity to that question. Could you talk a bit about card readings, if and how the way you facilitate a reading has changed since your first book? S: Speaking from the images on our cards using the “I Am One Who” exercise is very central to the power of the SoulCollage® process. One of our Facilitators, Audrey Chowdhury, remarked that creating all our cards and not reading from them is like making a great feast and not eating or sharing it. True! Speaking from our images, especially using ones drawn randomly from our decks to respond to a specific question, brings up surprising synchronicities and amazing insights. Each card may have a namable energy but that energy, when applied to a new question, will bring up ever-new responses. Perhaps one thing that was added in this new book is the importance of having a Scribe who will record the words spoken by the reader as he/she is speaking them. This allows the reader to stay more in the right brain, the intuitive side. Having a scribe also underlines the value of doing readings in a community. The community aspect of SoulCollage® is emphasized more strongly in the new book. L: I completely agree about the value of having a scribe, this keeps us from self-editing and totally present and in the flow of the card's "transmission." I talk about this on my website too. I know this is a popular question that you must be asked quite often, but I'll go ahead and ask anyway. Do you have a daily/regular SoulCollage® practice? What does that look like? L: Cultivating a daily spiritual practice is immensely important for me personally and for many of my readers as well. How does your personal SoulCollage® practice support your spiritual life? 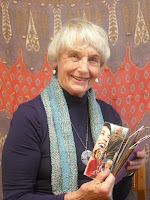 What other spiritual practices in your life support your work as the mother/midwife of SoulCollage®? As a healthy human? S: Daily meditation, daily yoga, daily walks, these I do. I don’t think of my life as being divided into sections with one part spiritual and the rest not, though sometimes my thoughts and actions are very mundane and earthy and even unproductive. Being spiritual for me is a constant reality but also a matter of levels; and my goal is to spend more time at a higher level of consciousness, dancing both as a many-faceted group of diverse Neters, while at the same time deeply sensing the miracle of our Oneness and giving thanks for that. When my inner dance is joyful, productive and compassionate, (and it is not at all always that! ), I suppose I feel closer to the Oneness of Source and to living from my SoulEssence. And I feel happier. (This is like being a bit closer to the top layer!) It can sometimes happen in silence and meditation, but I usually feel closer to Source on my knees in the garden, walking in nature, and even swimming in the pool than sitting on my meditation pillow. That’s just me, with my busy mind that hates to shut up. Obviously SoulCollage® is a great help in working with all my Neters to get them dancing in balanced and compassionate ways. My Council cards are particularly important to me in becoming more and more attentive to the invisible but real energies that surround me in my life journey, those that are guiding and supporting and prodding me. I can sometimes almost feel these “angels” guiding and supporting and even challenging me. Interesting question! It made me think a bit about this. L: The world has always been riddled with strife, probably since the first two separate "tribes" of humans met, eons ago. One might think there are more opportunities for misunderstandings in regard to cultural and religious differences because of the way the world is "shrinking" due to modern travel and technology. However, I believe that the more we connect and see and hear one another, that the possibility of true peace actually grows. I like to think blogging helps bridge the gaps so that we recognize ourselves in one another on a person to person level, at least that has been my experience. Please tell us about the way you see SoulCollage® as a vehicle for world healing and peace? S: I think it has potential to do quite a bit if it continues to grow. The more people heal their own inner wars, the better they will be at healing the wars in families and communities and nations. However that is only the beginning of what I think is possible. If enough people gather, using their images to find consciousness, they can become one more of the imaginal cells forming and joining up in our chaotic world to envision the butterfly that we could become. SoulCollagers can gather and show that cooperation is better than competition, that partnership is better than hierarchy or patriarchy, that knowing the one and the many is far, far better than insisting on one way or the other. Perhaps there can be a creative inclusiveness in SoulCollage® that will be catching. L: Ok, here is a personal question, one I have been asking all of my guest hosts during Gratitude Month at Shine the Divine, and all who are participating in the Second Annual Mega Mobius Gratitude Quilt this year (the purple link takes you to last year's quilt in case any readers are curious and have not noticed the enormous invitation to participate at the top of my blog!) Seena, if you close your eyes. Exhale fully. Inhale fully. Exhale again with a complete sigh of release, relief, opening to gratitude, what do you feel grateful for in your life, in THIS moment? S: This may seem foolish and trite as an answer but here it is anyway! I am thankful for the remaining taste in my mouth of a Dove dark chocolate that I ate a short time ago as a reward for sending in my November column. And I am grateful too for the abundance of more of these chocolates hidden in my underwear drawer. They are close at hand. This, if I ponder it, could be a metaphor for the delicious taste of these last days still in my Soul’s mouth, especially the two days in Sacramento. And it is gratitude for the abundance of days still hidden in my future where I hope to munch to my heart’s delight. I would be glad to share them if you drop by! 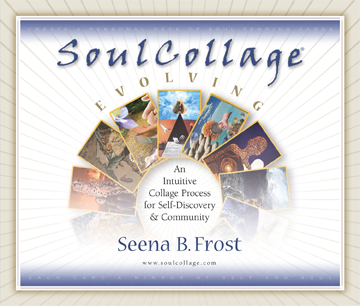 L: Thank you so much Seena for graciously answering all of my questions, for all that you do to bring ease and joy into the lives of others through the gift of SoulCollage®. PS I must say, I LOVE the dark chocolate Dove bars too!!! Here's a lovely short video, of Seena showing just how easy it is to create your own SoulCollage® cards. Seena's next blog stops are listed below! If you are interested in experiencing a SoulCollage® card reading, (as Seena suggested in the interview, it really helps to have someone to scribe for you. I also strongly believe in the value of having another compassionate human being taking on the sacred role of witness; an attentive listening presence, during a reading. Please contact me about a Lev b'Lev (heart to heart) SoulCollage® Guidance, a service I offer over the phone as a trained facilitator. I'll be talking a little bit more about this tomorrow when I offer a post on SoulCollage®. If you are curious, email me: laura@shinethidivine.com for more information. Seena B. Frost, M. Div., M.A. studied theology at Yale Divinity School, married, raised four children, and then received a Master's degree in psychology from Santa Clara University. She has been a psychotherapy clinician and supervisor in California for over thirty years, and has used many healing modalities including the work of C. G. Jung, Fritz Perls, Virginia Satir, Eric Berne, and others. I know I was meant to read this today. You know that I had my first experience with SoulCollage during a retreat in November, right? Well, the wonderful facilitator of that retreat was Audrey Chowdhury, the woman Seena quoted in this post. How grateful I am, that I had the opportunity to learn from her, and that she lives so close by. And how fortunate I am, that she has agreed to take our local SoulCollage group under her wing. Thinking of you and sending you lots of love and light, dear Laura. I like the idea of using a scribe, though for myself I generally prefer to use the freewriting approach where you simply write as fast as possible without censoring yourself at all. It takes practice though :). I smiled at the Dove chocolate (and it's nestled not-yet-savored companions). Thank you, Seena, and thank you, Laura, for a delightful interview. Thank you for this lovely interview and my introduction to SoulCollage... I think my mom would enjoy it. A lovely interview and a reminder on mindfulness. Picking out the cards each day is one way to help focus our intentions and keep us mindful of our path. Dove chocolate - great metaphor for the delicious taste of life!